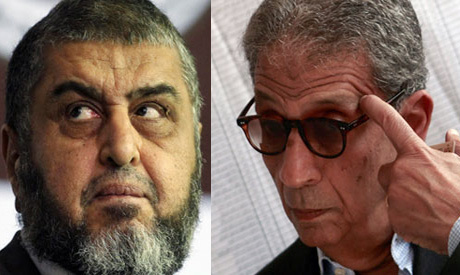 Khairat El-Shater (L), Amr Mousa, (Photos: Reuters). A Wednesday meeting between leading strategist of the Muslim Brotherhood Khairat El-Shater and opposition leader Amr Moussa has put the latter under fire. The dinner meeting was mediated by Ayman Nour, founder of the liberal Ghad El-Thawra party, and took place at his house. Saad El-Katatni, head of the Muslim Brotherhood's Freedom and Justice Party (FJP), was also invited but did not attend. To some, an abrupt, closed meeting between a leading member of Egypt's largest opposition coalition, the National Salvation Front (NSF), and the second-in-command of the ruling Muslim Brotherhood, the group which propelled President Morsi to power, is a source of concern. While critics say Moussa's move stands in startling contrast to the NSF's staunch opposition to the Islamist group, Moussa described the gathering as a "social, personal meeting that was under no commission from anybody." In a Thursday statement, Moussa criticised what he described as media confusion and agitation in reports about the meeting. He made it clear the encounter was not a secret, as his media team issued a statement shortly after it took place. "I accepted the invitation in an attempt to look into the different stances of the ruling officials at this critical juncture in Egypt's history," he said. Explaining his decision, Moussa said that it was vital to express to those within the ruling circle the outpouring of rage among the masses at the government’s performance. Moussa, who ran for president in the 2012 election that brought Mohamed Morsi to power, also said that during the meeting he had reiterated calls for snap presidential elections and restated his backing for planned anti-government demonstrations on 30 June. Moussa has endorsed the nascent anti-Morsi ‘Rebel’ campaign, which plans mass rallies on 30 June. Analysts say Moussa's action might create a rift between members of the already under-fire NSF. Reports of internecine struggles and dissatisfaction among the members of the opposition umbrella group have surfaced in recent days, with the group’s stance on a cross-party meeting hosted by Morsi last week to discuss a controversial new dam project in Ethiopia highlighting differences between key members. Most NSF leaders, including Moussa, Mohamed ElBaradei and Hamdeen Sabbahi, refused to take part in the meeting, but the founder of the liberal Egypt Freedom Party, Amr Hamzawy, participated, as did Ayman Nour. Ahmed Said, head of the Free Egyptians Party and another leading member of the NSF, lambasted the NSF for "letting down the masses." In a television programme on Wednesday, Said called for the creation of an alternative opposition grouping. "It merely aimed to draw differing viewpoints closer so as to achieve hoped-for reforms," Nour said in a Wednesday phone-in. "The identities of the guests have no implications," he asserted. Heba Yassin, spokesperson of Hamdeen Sabbahi’s Egyptian Popular Current, said that Moussa’s move did not represent the NSF as he had not made any prior arrangements with the coalition regarding the meeting. In February, NSF leader and key Egyptian opposition figure Mohamed ElBaradei held talks with FJP head El-Katatni, tackling a range of political issues. While being well-received by a handful of political forces, some NSF members claimed ElBaradei's decision to hold the meeting was made unilaterally without the agreement of the group's leading members. Moussa also met with El-Katatni twice in the same month. "The meeting represents a quantum leap," Turkish news agency Anadolu quoted Brotherhood spokesman Yasser Mehrez as saying on Thursday. "It aimed to break the ice between the two sides so as to start a [new] communication phase which will ultimately serve the interests of the state," he added.